How to Apply for KVS Teaching, Non Teaching Posts Recruitment 2018: Kendriya Vidyalaya Sangethan (KVS) is an autonomous organization under the Ministry of Human Resource Development, Government of Ind has issued a direct recruitment notification and the KVS invites Online applications from the eligible Indian Citizens for filling up the Officers' Cadre, Teaching, Misc. Teaching and Non-Teaching posts to be filled up by direct recruitment. here how to apply, age relaxation, examination fee, mode of payment details, scheme of examination, examination pattern, important instructions and other details are provided here. The registration process for various vacancies in KVs will end soon. Kendriya Vidyalaya Sangathan, KVS, the official agency which governs the admission and recruitment processes on Kendriya Vidyalayas across the country, had earlier announced 8,339 vacancies of Principals, Vice Principals and teachers. KVS had announced the vacancies on August 14, 2018. The application process for various posts including teachers and librarians is being done online at the official website kvsangathan.nic.in. The last date was earlier fixed on September 13, however, it was later postponed to September 23. The recruitment is being done to posts like Principal, TGT, PGT, PRT, Librarian and Vice-Principal. It is mandatory for the aspirants for the posts of Primary teachers and Trained graduate teachers to have qualified in CTET or Central Teacher Eligibility Test. However, KVS had allowed the fresh CTET-2018 aspirants also for participating in the recruitment process and extended the last date of application for ten more days i.e., from 13th September to 23rd September. "This move has seen manifold increase in the number of applicants for these posts. Last three days are left for aspiring candidates to register their candidature through online application," KVS said in a statement. More details on KV recruitment process 2018 can be found at the official website of the Sangathan. Kendriya Vidyalaya Sangathan has released an official notification inviting applications for the posts of Principal, Vice- Principal, TGT, PGT, PRC and Librarian. KVS Recruitment 2018 is for a total of 8,339 posts across various locations. The details of the vacancy is provided below. Registration process for KV teacher, Principal recruitemnt will commence from August 24 and will end on September 23. Candidates can apply on the official website kvsangathan.nic.in.Eligibility, age limit and vacancy detail for the recruitment is summarized below. Candidates are however advised to go through the detailed notification before filling the online application forms. Also, the last date to apply is September 23, 2018. Applications would only be accepted online through the official portal kvsangathan.nic.in. 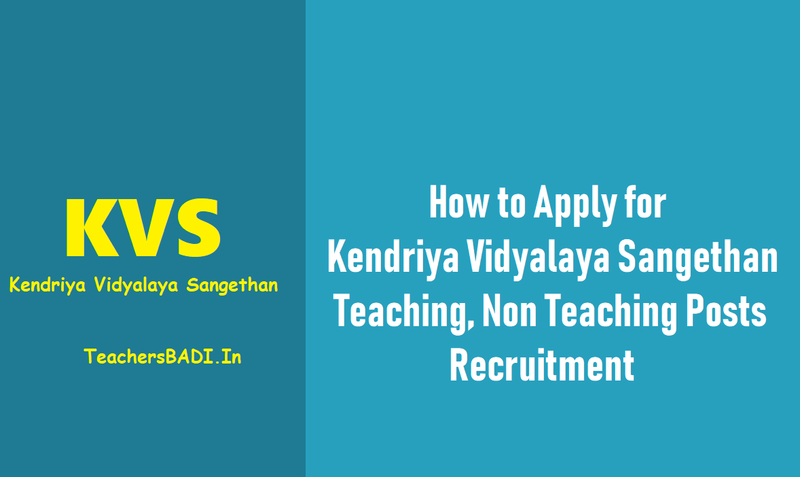 The Kendriya Vidyalaya Sangathan (KVS) invited online applications for recruitment of Principals, Vice-Principals, Post Graduate Teachers (PGTs), Trained Graduate Teachers (TGTs), Librarians and Primary Teachers (PRTs). The application process begins on August 24 and closes on September 23, 2018. The examination will be held in the offline mode. Candidates can apply till September 23, 2018. The number of tentative vacancies to be filled through the examination is more than 8,000. There are 76 posts for principal (Group A), 220 for vice principal (Group A), 592 for PGTs (Group B), 1900 for TGTs(Group B), 50 for Librarian (Group B), 5,300 for Primary Teacher (Group B) and 201 vacancies for Primary Teachers (Music) (Group B). Interested candidates can apply by visiting the official website: kvsangathan.nic.in. Applications can be made in the online mode only. KVS also issued the amendments in essential qualifications for recruitment of primary teachers. Candidates can check the amendments by clicking here. There is a varying age limit on the various posts that are provided below. Principal: The candidates should be 35- 50 years old. Vice- Principal: The candidates should be 35- 45 years old. PGT: The candidates must not exceed the age limit of 40 years as on September 30 2018. TGT: The candidate should not be more than 35 years of age as on September 30 2018. Librarians: The candidates should not be more than 35 years of age. A relaxation on the age limit will be given to candidates belonging to the reserved categories. The selections will be made on the basis of the recruitment test, which will be taken offline. PGT: All candidates interested in applying for the post of Post Graduate Teacher (PGT) must possess a degree in Masters in the concerned subject from a recognized institution. The applicant should also have a BEd degree or its equivalent. The applicant must also be proficient in teaching in both, English and Hindi. a) No upper age bar in the case of employees of Kendriya Vidyalaya Sangathan. b) Upto a maximum of 5 years in the case of SC/ ST candidates. c) Upto a maximum of 3 years in the case of OBC candidates. d) Upto 5 years for persons who had ordinarily been domiciled in the State of Jammu and Kashmir during 01.01.80 to 31.12.89.
e) Upto a maximum of 5 years for Government Servants. f) Upto a maximum of 10 years in the case of SC/ST and 08 years in the case of OBC candidates serving as Govt. employees in accordance with the Govt. of India instructions. An applicant claiming age relaxation under this para should produce a certificate from his/her employer to the effect that he/ she is a Govt. servant as on the date of advertisement. g) Upto a maximum of 10 years in the case of Persons with Disability categories. h) Upto a maximum of 10 years for women candidates for TEACHING POSTS ONLY including SC/ST/OBC candidates. i) Age relaxation for Ex-servicemen will be given as per Govt. of India Rules. 1. Eligible and interested candidates would be required to apply only online through KVS's website www.kvsangathan.nic.in or https://jobapply.in/kvs/ . 2. Before applying for the post, the candidates must have a valid email id through which he/she will fill up the online application. 3. Candidates are required to visit KV5's website www.kvsangathan.nic.in or https ://jobapply. in/kvs/ where complete advertisement, details regarding eligibility criteria, selection procedure, application fee, online registration and general conditions are available. 4. Candidates applying online are required to take print out of auto generated filled in application format. 5. The candidates for the posts advertised have to keep a set of application with documents duly photocopied with him/her for record and the same to be produced at the time of interview/skill test, if shortlisted. 6. Candidates are not required to submit to Kendriya Vidyalaya 5angathan (KV5) either by post or by hand the printout of their online applications or any other documents. 7. No other means/mode of application will be accepted. Before applying the candidates should ensure that they fulfill all the eligibility norms. 8. Their registration will be provisional at all stages of recruitment as their eligibility will be verified only at the time of Interview. Mere issue of admit card/Interview call letter will not imply acceptance of candidature of the applicants. Candidature of a registered candidate is liable to be rejected at any stage of recruitment process or even after joining, if any information provided by the candidate is found to be false or not in conformity with the eligibility criteria at any stage. Candidates are required to pay a non-refundable application fee of Rs 1200/- ( one thousand two Hundred only) for the posts of Vice-Principal and Finance Officer ans Rs 750/- seven hundred and fifty only) for other teaching and non-teaching posts. The fee once paid will NOT be refunded on any account nor would this fee be held in reserve for future examination/selection. For making payment through Credit/Debit Card (Master or Visa approved); Indian Bank will charge Rs. 30/- (Thirty only) as "service charge" in addition to the fees. Candidates should fill in the details to register and then fill the information in the online application form at the appropriate places very carefully as per the instructions available on the website. Fee once paid will not be refunded under any circumstances. Candidates are, therefore, requested to verify their eligibility before paying the application/processing fee and to fill in the payment details carefully. After filling the information candidate is required to proceed for making the payment through Credit/Debit Card (Master or Visa approved). 1. On successful transaction of the payment through payment gateway, auto generated application number will be issued. 2. Candidate has to take the print out of the Application Form containing the auto generated application number and keep it along with documents duly photocopied with him/her for record and the same to be produced at the time of interview/skill test, if shortlisted. 3. Candidates applying for the posts advertised are not required to submit the documents i.e. Printout of application forms along with testimonial and service certificate to Kendriya Vidyalaya 5angathan (KV5) either by post or by hand. a. For the post of Post Graduate Teachers (PGTs), Part I will comprise of 40 multiple choice questions in English and Hindi subjects carrying 20 marks each (total 40 marks). Part II will consist of 160 multiple choice questions of 1 mark each comprising Current Affairs (20), Reasoning and Numerical Ability (20), Teaching Methodology (20) and the subject concerned (100) questions (The syllabus for subject concerned is available on KVS website) . The test will be of 03 hours duration. The Part II of the candidate will be evaluated only if he/she qualifies Part I securing 5 marks each in English & Hindi subjects and 13 marks in aggregate in English and Hindi. The final merit will be based on the performance of the candidate in written test (Part II) and interview. The weightage of written test (Part II) and interview will be 70:30.
b. For the post of TGT (P&HE, WE, AE) and Librarian, Part I will consist of 40 multiple choice questions in the subjects English and Hindi carrying 1 mark each. Part II will consist of 160 multiple choice questions carrying 1 mark each comprising of Current Affairs (30), Reasoning and Numerical Ability (30) and concerned subject (100) questions. (The syllabus for subject concerned is available on KVS website). The test will be of 03 hours duration. The Part II of the candidate will be evaluated only if he/she qualifies Part I securing 5 marks each in English & Hindi subjects and 13 marks in aggregate in English and Hindi subjects. The final merit list will be based on the performance of the candidate in written test (Part II) and interview. The weightage of written test (Part II) and interview will be 70:30.
c. For the posts of TRAINED GRADUATE TEACHERs (English, Hindi, Maths, Sanskrit, Science and Social Studies) and PRIMARY TEACHERS, Part I of the question paper will consist of 30 multiple choice questions in English (15) and Hindi (15) questions carrying 1 mark each. Part II will consist of 120 multiple choice questions carrying 1 mark each comprising of Current Affairs (40), Reasoning Ability (40) and Teaching Methodology (40). The total duration of test for the posts of TGTs and Primary Teachers will be two and a half hours each. Part II of the question paper of the candidate will be evaluated only if he/she qualifies in part I securing 4 marks each in English and Hindi subjects and 10 marks in aggregate. The final merit will be based on the combined performance in the written test (Part-II) and interview and the weightage will be 70:30.
d.. For the post of PRT (Music), Part I of the question paper will consist of 30 multiple choice questions in the subjects English (15) and Hindi (15) carrying 1 mark each. Part II of the question paper will consist of 120 multiple choice questions carrying 1 mark each in Current Affairs (30), Reasoning Ability (30) and Subject Related Questions (Musicology) (60) questions. (The syllabus for subject concerned is available on KVS website). The paper will be of two and a half hours duration. Part II of the question paper of the candidate will be evaluated only if he/she qualifies in part I securing 4 marks each in English and Hindi subjects and 10 marks in aggregate. For preparation of the final merit, the weighted evaluation scheme shall be Written Test 50%( Part-II), Performance Test 30% and Interview 20%. 1. The candidates applying for the examination should ensure that they fulfill all eligibility conditions for admission to the examination. Their admission at all the stages of the examination will be purely provisional subject to satisfying the prescribed eligibility condition(s). 2. Mere issue of Admit Card to the candidate will not imply that his/her candidature has been finally cleared by the KVS. 3. The cut off date for determining the age, educational qualifications, experience etc. will be the last date of submission of application through online. 4. Only Central Teacher Eligibility Test (CTET) pass candidates (Paper II), having professional qualification of B.Ed are eligible to apply for the posts of TGT (English, Hindi, Sanskrit, Maths, Science and Social Studies). The candidates with professional qualification of Special B.Ed OR D.Ed. OR Special D.Ed. are not eligible to apply for these posts. 5. For the post of Primary Teacher, Central Teacher Eligibility Test (CTET) pass candidates (Paper-I) with professional qualification of Diploma in Education (D.Ed.) or Bachelor in Elementary Education (B.E1.Ed.) are eligible to apply. The candidates having professional qualification of B.Ed or Special B.Ed are not eligible to apply for the post of Primary Teacher. 6. The KVS takes up verification of eligibility conditions with reference to original documents only after the candidates have qualified for interview. As such, the candidates may ensure their eligibility before applying for the post. The candidates if found in-eligible , his/her candidature for the post will be summarily rejected. 7. Fee once paid will NOT be refunded under any circumstances. No fee is required to be paid by SC/ST/Persons with Disability candidates and Ex-servicemen categories. 8. The vacancies may vary. They may increase or decrease. 9. KVS will not enter into any correspondence with the candidates about their candidature. 10. 5% relaxation in CTET marks has been given to the candidates belonging to SC, ST, OBC and Persons with Disability category. Candidates belonging to SC, 5T, OBC and Persons with Disability categories who have passed CTET with 82 marks or more are eligible to apply for the posts of TGT (English, Hindi, Sanskrit, Maths, Science and Social Studies) and Primary Teacher as per their eligibility for the post. 11. No age relaxation will be given to the candidates working in Autonomous Body/Statutory Body /Public Sector Undertaking. 12. The service of the candidates who is working on regular continuous basis in Central/State Govt./Autonomous Body of Central/State Govt/Public Sector Undertaking will be counted for experience purpose wherever required. Adhoc/Contractual service and different pay scales other than those mentioned in the advertisement will not be counted for experience purpose. 13. UDC in the pay band of Rs.5200-20200 with grade pay of Rs.2400 having 3 years regular continuous service in Central/State Govt./ Autonomous Body of Central/ State Govt. and Public Sector Undertaking are eligible for the post of Assistant in KVS. 14. LbC in the pay band of Rs.5200-20200 with grade pay of Rs.1900 having 3 years regular continuous service in Central/State Govt./Autonomous Body of Central/State Govt. and Public Sector Undertaking are eligible for the post of Upper Division Clerk in KVS. 15. The candidates working in Government organizations are required to submit NOC /VIGILANCE /SERVICE certificate at the time of interview/skill test, if shortlisted. 16. The OBC candidate must produce a certificate in the prescribed proforma, as is issued for employment in Central Govt. Offices and they should not be from creamy layer. 17. In case of Selection of a Candidate to the post advertised, he/she shall be posted anywhere in India and the candidate will have no vested right to be posted at the place of his/her choice. 18. Mobile phone pagers, Bluetooth or any other communication devices are not allowed inside the premises where the examination is being conducted. Any infringement of these instructions shall entail disciplinary action including ban from future examinations. 19. Canvassing in any form will disqualify the candidature of the applicant. 20. For all practical purpose or in case of any discrepancy in the context of text of the advertisement in Hindi language , the English version of the advertisement will prevail.